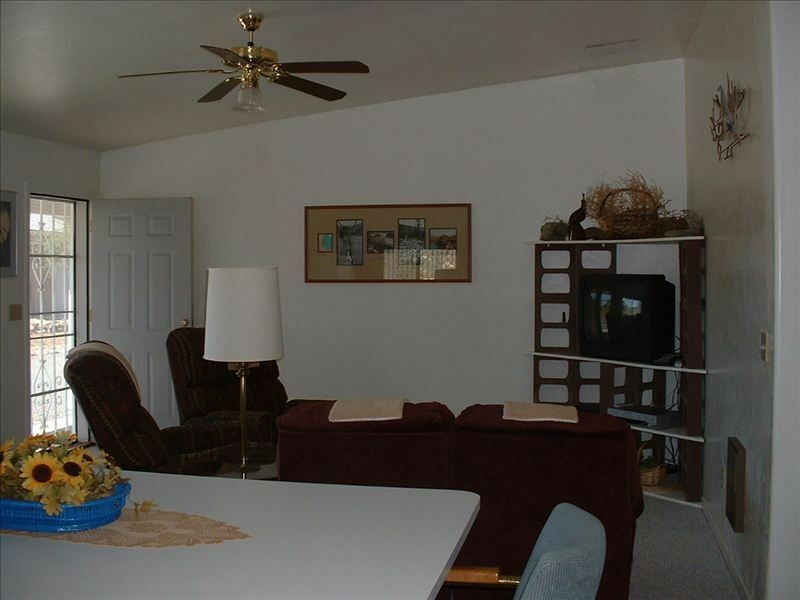 Furnished Guest House Located at Gateway to Northern Arizona. Fully furnished guest house at Cordes Junction (I-17 and SR 69). Just bring clothes, toiletries and groceries. Great "home base" where guests can sleep, shower, launder/dry their clothes and fix all their own meals. Only a few minutes drive south to Phoenix, and west to the Prescott area, and north to the Sedona area. A few hours drive north to the Grand Canyon and Lake Powell. A few hours drive east to Arizona's beautiful White Mountains. Cordes Junction is surrounded by the Tonto, Mingus and Bradshaw mountain ranges with plenty of wildlife and hiking trails. Our guests love the central location of a 'home base" where they can enjoy many day trips visting and sightseeing in other nearby towns, and still return to enjoy a relaxing evening at home. This rural setting is very quiet with clean air and dark sky illuminated with bright stars. We invite you to be our guests. Ken and Nancy built this property in 1995 and operated a bed & breakfast, known as "Boyds Bunkhouse Bed & Breakfast" for approximately 2 years. They subsequqently offered short-term housing to out-of-state folks who were in transition moving to the Prescott, Prescott Valley, Camp Verde areas. Cordes Junction is the ideal retirement area -- it offers not only the rural lifestyle but is close enough to the metropolitan area of Phoenix for professional athletic events, cultural arts, shopping and city-wide events. Love the weather (cooler than Phoenix in the summer and warmer than Prescott in the winter). The Mayer-Spring Valley-Cordes Junction area is known as the "comfort corridor". Attached covered parking for 1 car (carport); outside parking for second car at end of driveway. In compliance w/ country fire dept., no parking is allowed in the driveway. 4 recliner Lazy-Boy fabric chairs, 40" flat screen TV w/ DirecTV programming, and Blue-Ray DVD player. Attached carport w/ direct entry into kitchen. Additional onsight parking may be available depending on size of vehicle, trailer or boat. Extremely comfortable guest house. If you like to cook while on vacation, you won’t find a better equipped kitchen than this one. Ken and Nancy were charming, and Nancy even shared with us some homemade treats while we were there. We split our time in Arizona between Phoenix and Sedona, and this location was perfect. We’d definitely stay here again if we’re back in the area. We spent two weeks at the Bunkhouse. Family of five, with gluten allergies. The house was clean and spacious (kitchen with LARGE counters open to family room, vaulted ceilings, huge bedroom, washer and dryer, and TONS of storage), in quiet and peaceful surroundings. We worried about having allergy cross-contamination issues in the kitchen, but we had none (though we didn't use the toaster)...that's how clean the kitchen was!!! We enjoyed our stay and will return if we visit again. 5 miles to world reknown Arcosanti, home of the famous Solari bells; 25 miles North to Cliff Castle Casino, a family oriented casino with fine dining, coffee shop, and 50's diner; 45 minutes to Clarkdale to ride famous scenic Verde Railway. Approx 1-hour drive to Sedona. Approx 2-hour drive to the south rim of the Grand Canyon.